(Newser) – South Korea's president warned Tuesday that rival North Korea faces collapse if it doesn't abandon its nuclear bomb program, an unusually strong broadside that will likely infuriate Pyongyang. 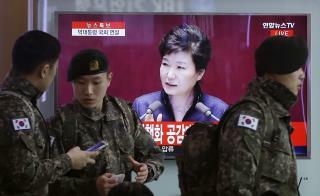 President Park Geun-hye, in a nationally televised parliamentary address, said South Korea will take unspecified "stronger and more effective" measures to make North Korea realize its nuclear ambitions will result only in speeding up of its "regime collapse." The speech was meant to defend Park's decision last week to shut down the Koreas' last major cooperation project, a jointly run factory park in the North Korean border city of Kaesong. DPRK is the most dangerous country on earth right now as they are willing to use their few nuclear weapons and the world kowtows to them with all sorts of food aid to keep their regime going. The South is finally realizing they have been supporting them out of fear of the North. Even China now recognizes North Korea as a nuclear weapon threat.